The Out & Loud choral festival celebrates pride in our LGBTIQ+ community through music. The festival is the only occasion when Australian and New Zealand choirs meet at one event to share the joy of singing, socialising, drawing inspiration and learning from each other. Canberra Gay and Lesbian Qwire is delighted to be hosting the 2019 festival from 24-28 October. Canberra’s Out & Loud Festival will be a wonderful mixture of LGBTIQ+ choirs singing their hearts out, learning new material with our guest conductor Stephen Leek as well as performing their own repertoires at iconic Canberra venues. The festival will culminate in a gala concert where the specially commissioned massed choral work by Sally Whitwell will be performed. There will be a range of music workshops and social events as well as some private tours of Canberra’s national institutions such as the National Gallery of Australia. And the following week Canberra’s SpringOUT festival begins. We are honoured to have Stephen Leek and Sally Whitwell join us for our Canberra Out & Loud Festival. Stephen Leek as our Guest Conductor will ensure we are performance ready for our gala concert where we will sing 3 massed choral pieces including a newly commissioned work by Sally Whitwell. 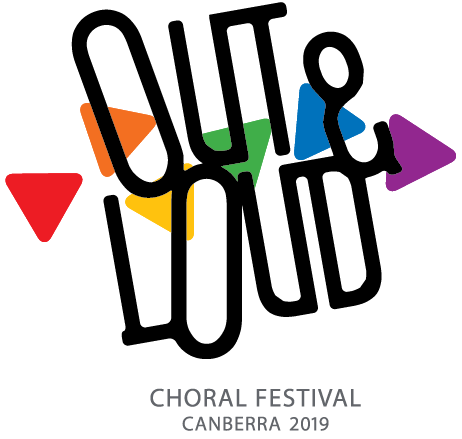 And with our 8 LGBTIQ+ choirs performing across Canberra’s iconic venues as well as in the gala concert, Canberra is in for a treat. Freelance Australian Composer/Conductor Stephen Leek (b.1959) has long associations with some of the finest and most innovative choirs and musicians around the world. As a conductor, Leek is in demand to work as guest conductor, workshop leader and teacher, and as a composer, his extensive body of work and has its own distinctive sound world that reflects the country of his birth. His works has broad appeal and are performed by a wide selection of choirs throughout the world. Leek has received many national and international awards including the prestigious “Robert Edler International Choral Prize” for his contribution to the development of global and Australian choral music and several national APRA ARTmusic Awards for Composition, Community and as the most Distinguished Contribution to Australian Music by an Individual. Currently Leek is Artistic Director / General Manager of the Young Music Society in Canberra, providing quality music experiences for young people, whilst maintaining a freelance career across Australia and around the globe. From little things big things grow, so the saying goes – an ad in a gay newspaper, a group of friends meeting to sing together in a garage: these were the beginnings of the Canberra Gay and Lesbian Qwire, now popularly known as Qwire, back in 1993. Since then, we’ve grown and grown to become one of Canberra’s leading non-auditioned choirs of around 100 singers. We’ve toured overseas six times, given countless concerts and hundreds of community performances, witnessed births, deaths and now marriages! Along the way, we’ve given a live performance on ABC Classic FM, sung in the streets of Auckland, and performed outside Parliament House in our city when the equal marriage legislation was passed. Last year we celebrated our 25th anniversary with a gala performance showcasing our journey, taking pride in our inclusivity, and continuing to promote understanding and awareness of the city’s LGBTIQ+ community through music. We’re immensely proud to be hosting the 2019 Out & Loud Festival, and wish you all welcome and good singing! Award-winning musician Sally Whitwell maintains a busy freelance career as pianist, performer, conductor, composer and educator. Sally was born in Canberra in 1974 where she spent her childhood and school years. Her debut album, solo piano music by Phillip Glass, won the 2011 ARIA for Best Classical Album, and her 2013 album of Michael Nyman solo piano music won the 2013 ARIA for Best Classical Album. Sally is very active as a conductor, composer and accompanist in choral music. Her choral and vocal ensemble compositions have been performed by Juice vocal ensemble, Gondwana choirs, VOX, Moorambilla Voices, Leichhardt Espresso Chorus, Luminescence, Hunter Singers and the Woden Valley Youth Choir. Sally is a featured artist with ABC Classic FM. Brisbane Pride Choir originally formed as the Brisbane Lesbian and Gay Pride Choir in 1998. What began as group of people who came together for a series of singing workshops funded by a Brisbane City Council grant, soon bloomed into the full SATB choir that exists today, celebrating our 20 year anniversary this past May with a concert at the Brisbane Powerhouse. Since 2011, the Glamaphones have been Wellington’s gay, lesbian, bisexual, transgender, intersex community SATB choir. The choir’s emphasis is on participation, inclusiveness and building the LGBTIQ community. The choir has nearly 60 members. MGLC is an award-winning choir, with a passionate commitment to creating community through music. They strive for musical excellence and offer a supportive environment for enjoyable learning and performance and welcome all who share our vision and love of music. MGLC is made up of singers of all backgrounds, ages and levels of musical experience and has stood as proud role models in the LGBTQI+ community since their inception in 1990.
shOUT (formerly the Melbourne Gay and Lesbian Youth Chorus) was founded in 2005, and is Australasia’s first LGBTQI+ youth chorus. shOUT is a chorus of the MGLC and is proud to provide young people aged between 18 and 29 with a fantastic, safe and friendly environment in which to develop their singing skills. GALSWA has been singing proudly as part of the Perth LGBTI+ community for the past 25 years. We are a non-auditioned choir and welcome members from all colours of the sexuality and gender diversity rainbow and our allies. Our motto is Harmony in Diversity. GALSWA sing at events within our community and also in wider community events, and work towards an annual concert with a different theme each year. We are proud to say that we have attended every Out & Loud festival. There is a great deal of enthusiasm for singing and importance placed on the community spirit of the choir, which is manifested in the strong social role of the choir. We see ourselves not just as a choir but as a family. Sydney Gay & Lesbian Choir is a non-auditioned choir that welcomes members regardless of their sexual identity or musical experience. With 80 active singers at most times, the choir is open to all – lesbian, gay, bisexual, transgendered, intersex, queer and our straight allies. What unites us is a love of singing together and striving for performance excellence. A powerful symbol of diversity, inclusion and harmony, the choir has maintained a vital and visible presence in the history of Sydney’s LGBTQI community. Sydney Gay & Lesbian Choir has provided the soundtrack to countless community events and celebrations over the years, and has regularly represented Sydney on the national and international stage. Our repertoire is equally diverse, ranging from classical to pop, and from music theatre to contemporary Australian compositions. GALS is Auckland's non-auditioned rainbow community choir. Going strong since 1992, it was the first-established gay and lesbian choir in New Zealand. As well as its own public concerts presented to family, friends and the wider community, GALS participates at annual rainbow community events such as Big Gay Out, the Auckland Pride Festival and Parade and World AIDS Day activities. GALS has travelled beyond New Zealand many times, members having participated in singing festivals at the Gay Games, World Outgames and Various Voices in cities as far afield as Chicago, Montreal, Amsterdam, Sydney, Cologne and most recently in Munich. True Colours Chorus, Darwin, was originally conceived of, in late 2017, as an inclusive choir for members of the City and Greater Region of Darwin's gender and sexually-diverse community and its allies - a creative community meeting place and an opportunity to positively increase the visibility of the LGBTIQA+ community of Darwin. True Colours Chorus fosters a collaborative environment with members suggesting repertoire, teaching their favourite songs, sharing the role of conducting, and volunteering their time with the library and accounting. True Colours Chorus successfully put on its first show - 'Songs of Unity, Pride and Love' - during Darwin Pride Festival last September at Brown's Mart Theatre. The show was a sell out, and was very well-received, both by the local queer community, and by the wider Darwin community. The festival will take place across Canberra’s iconic venues culminating in a gala concert at the city’s premier music venue Llewellyn Hall. University House, in the beautiful grounds of the Australian National University, will be our festival home for 4 days where we will have our workshops and rehearsals with our guest conductor and other professional musicians. Individual choirs will have the amazing opportunity to perform at the National Gallery of Australia, the National Portrait Gallery and the Museum of Australian Democracy (Old Parliament House) to the delight of visitors. And we will be welcomed to Canberra at the splendid art deco National Film and Sound Archive.